There’s no denying that a bright, white smile demands attention. White teeth portray healthy oral hygiene, and can significantly improve your appearance and confidence, but how do you get whiter teeth? What’s the safest procedure? Teeth whitening treatments are no longer deemed exclusive to celebrities and wealthy people. More and more people are discovering natural whitening methods, such as coconut oil pulling, which involve swirling coconut oil in your mouth for up to twenty-minutes to extract toxins from the body and remove discolouration on your teeth. Others are opting for drugstore whitening kits and toothpastes – which fail to give you the results you desire majority of the time. Yes, these methods are cheaper than professional whitening treatments performed by dentists; however, the results only temporarily eliminate stains from your teeth, and restore their natural whiteness, which could only be a shade or two lighter at most. A small investment into professional whitening treatments – performed by a qualified dentist – will produce safer, whiter, brighter, longer lasting results. Professional laser whitening effects can last up to three years, varying from person to person. You can achieve up to 6 shades whiter teeth within just 1 hour with our Zoom Whitening treatment, performed by our qualified dentist. 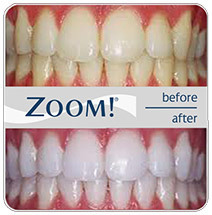 We offer Zoom home whitening kits – day and night – so that you can maintain your new pearly white smile, after receiving your professional laser teeth whitening treatment. These kits contain ACP to reduce sensitivity after treatment and maximise results. Everyone responds differently to teeth whitening treatments and tooth sensitivity is sometimes a side effect of this. Therefore, our dentist will perform an assessment of your teeth before proceeding to ensure they are suitable for the treatment (in most cases they are). We recommend Philips Zoom home whitening kits to protect your teeth post-treatment as they’re clinically proven to manage tooth sensitivity and protect enamel – resulting in pain free laser whitening! For more information about our professional whitening treatments and home kits, click here.